The Matek HUBOSD eco X-Type PCB is a multifunctional HUB with 4 channel PDB, dual BECs, a current sensor and a plug and play integrated OSD. The PDB can provide power up to four ESCs rated at 30A per channel and compatible with 3 to 5S LiPo batteries. The BEC outputs provide 5volts at 2A and 12volts at 0.5A. 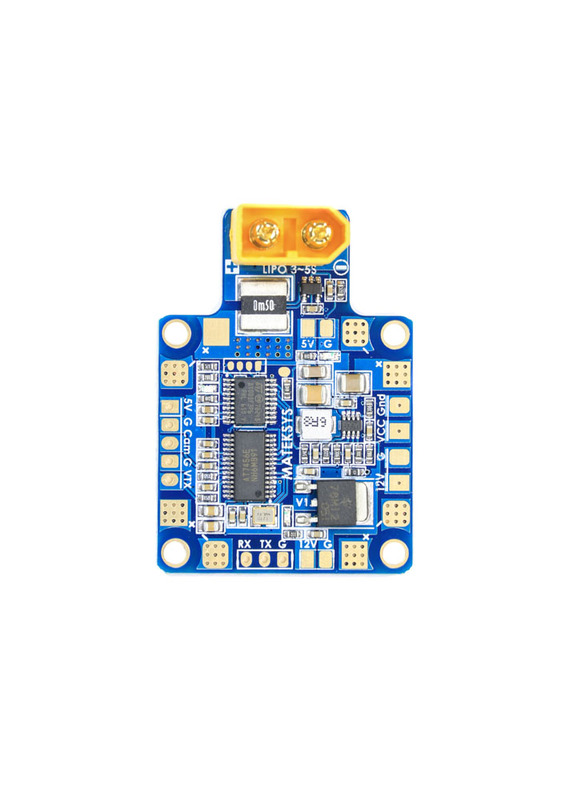 The 5V BEC connection is ideal for powering your flight controller or RC receiver. The 12v BEC is a linear type regulator so no LC filter is needed to clean up the power supply if used for a 12V FPV camera. The built-in STOSD8 (OSD) is integrated into the PDB and therefore super easy to use as it doesn't rely on a connection to you FC; it's totally independent. It supports lots of functions including auto battery cell detection, low voltage alarm, current draw, automatic flight timer, onscreen pilot ID and more. The OSD function can be used without any programming, but if you wish to change any of the default settings or enable functions for example the pilot ID, there is a very simple GUI - download here (you will need a FTDI USB programmer). The PDB is well designed with corner mounted ESC power connections for a neat installation and a sided mounted XT60 power connector. 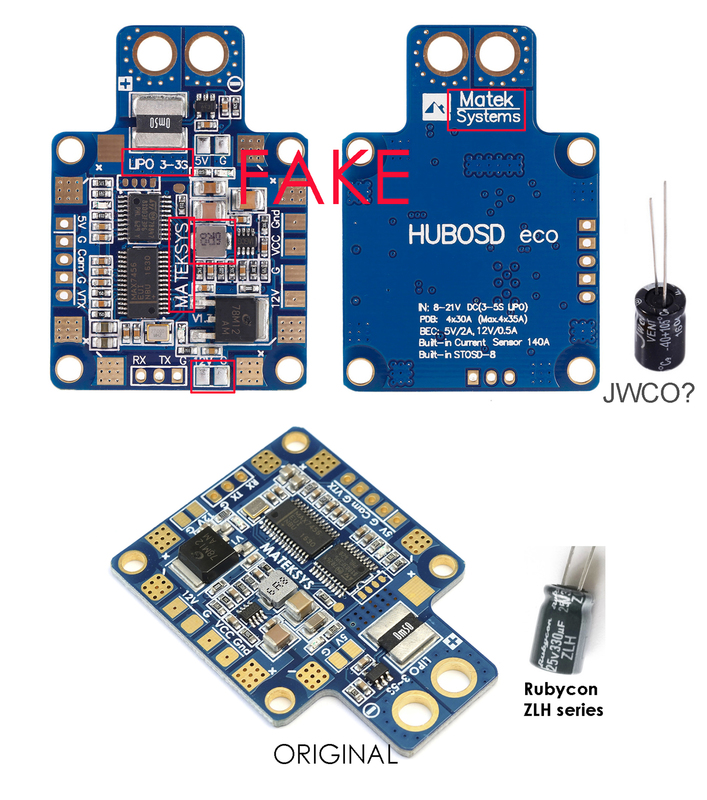 The HUBOSD Eco PDB is also available in an H configuration - HUBOSD eco H-Type. Genuine Matek Product - beware of fakes. Autodetect PAL/NTSC - Auto sense PAL / NTSC cam at OSD startup. Dynamic on screen info - Basic info for flight. More info after landing. Automatic flight timer - Trigger but a current >2A. Automatic cell detection - STOSD detects the cell numbers automatically when the LiPo is connected. Low voltage alarm - Auto battery alarm blinks the battery voltage when pack voltage hits the low limit. Exceeding mAh alarm - Auto capacity alarm blinks the mAh when capacity exceed the setting. Default is 1000mAh. Min.voltage & Max.current recorder - Current less than 2A & keep 5 seconds. Min.Voltage & Max.current will be shown on screen. Onscreen Pilot ID - Default Pilot ID is disable. you can enable it in GUI. Firmware upgradable - Firmware upgradable to ensure any user can enjoy any new features that we might release the future. Plug & Play - You can use it with default firmware & settings. No PC connection needed if you don’t want to change the settings. Simple GUI - No complicated settings. I purchased this item "Matek Systems HUBOSD eco X-Type w/STOSD8 (OSD), Current Sensor and Dual BEC - 5S Max" from you a while ago. Could you please advise how to attach the yellow power connector onto the PCB board? I tried soldering, but the solder does not stick on the material at the connection, which lead me to speculate they are meant to be assembled with a different method. Hi, soldering is the correct method. You need a solder that flows nicely and you might find that you need a soldering iron with more wattage.